Not to be confused with Lawrence Lessing. Rapid City, South Dakota, U.S.
Lester Lawrence "Larry" Lessig III (born June 3, 1961) is an American academic, attorney, and political activist. He is the Roy L. Furman Professor of Law at Harvard Law School and the former director of the Edmond J. Safra Center for Ethics at Harvard University. Lessig was a candidate for the Democratic Party's nomination for President of the United States in the 2016 U.S. presidential election, but withdrew before the primaries. Lessig is a proponent of reduced legal restrictions on copyright, trademark, and radio frequency spectrum, particularly in technology applications. In 2001, he founded Creative Commons, a non-profit organization devoted to expanding the range of creative works available for others to build upon and to share legally. Prior to his most recent appointment at Harvard, he was a professor of law at Stanford Law School, where he founded the Center for Internet and Society, and at the University of Chicago. He is a former board member of the Free Software Foundation and Software Freedom Law Center; the Washington, D.C. lobbying groups Public Knowledge and Free Press; and the Electronic Frontier Foundation. As a political activist, Lessig has called for state-based activism to promote substantive reform of government with a Second Constitutional Convention. In May 2014, he launched a crowd-funded political action committee which he termed Mayday PAC with the purpose of electing candidates to Congress who would pass campaign finance reform. Lessig is also the co-founder of Rootstrikers, and is on the boards of MapLight and Represent.Us. He serves on the advisory boards of the Democracy Café and the Sunlight Foundation. In August 2015, Lessig announced that he was exploring a possible candidacy for President of the United States, promising to run if his exploratory committee raised $1 million by Labor Day. After accomplishing this, on September 6, 2015, Lessig announced that he was entering the race to become a candidate for the 2016 Democratic Party's presidential nomination. Lessig has described his candidacy as a referendum on campaign finance reform and electoral reform legislation. He stated that, if elected, he would serve a full term as president with his proposed reforms as his legislative priorities. In November 2015, he ended his campaign. Lessig earned a B.A. degree in Economics and a B.S. degree in Management (Wharton School) from the University of Pennsylvania, an M.A. degree in Philosophy from the University of Cambridge (Trinity) in England, and a J.D. degree from Yale Law School in 1989. After graduating from law school, he clerked for a year for Judge Richard Posner, at the 7th Circuit Court of Appeals in Chicago, Illinois, and another year for Justice Antonin Scalia at the Supreme Court. Lessig started his academic career at the University of Chicago Law School, where he was Professor from 1991 to 1997. As co-director of the Center for the Study of Constitutionalism in Eastern Europe there, he helped the newly-independent Republic of Georgia draft a constitution. From 1997 to 2000, he was at Harvard Law School, holding for a year the chair of Berkman Professor of Law, affiliated with the Berkman Center for Internet & Society. He subsequently joined Stanford Law School, where he established the school's Center for Internet and Society. Lessig returned to Harvard in July 2009 as Professor and Director of the Edmond J. Safra Center for Ethics. In 2013, Lessig was appointed as the Roy L. Furman Professor of Law and Leadership; his chair lecture was titled "Aaron's Laws: Law and Justice in a Digital Age." Lessig was portrayed by Christopher Lloyd in "The Wake Up Call", during season 6 of The West Wing. Lessig has been politically liberal since studying philosophy at Cambridge in the mid-1980s. By the late 1980s when he was selected to serve as a law clerk for two influential conservative judges, Judge Richard Posner and Justice Antonin Scalia, he was effectively the token liberal on their staffs, chosen for his brilliance rather than for his ideology. Posner would later call him "the most distinguished law professor of his generation." Lessig has emphasized in interviews that his philosophy experience at Cambridge radically changed his values and career path. Previously, he had held strong conservative or libertarian political views, desired a career in business, was a highly active member of Teenage Republicans, served as the Youth Governor for Pennsylvania through the YMCA Youth and Government program in 1978, and almost pursued a Republican political career. What was intended to be a year abroad at Cambridge convinced him instead to stay another two years to complete an undergraduate degree in philosophy and develop his changed political values. During this time, he also traveled in the Eastern Bloc, where he acquired a lifelong interest in Eastern European law and politics. Lessig remains skeptical of government intervention but favors some regulation, calling himself "a constitutionalist." On one occasion, Lessig also commended the John McCain campaign for discussing fair use rights in a letter to YouTube where it took issue with YouTube for indulging overreaching copyright claims leading to the removal of various campaign videos. Lessig has known President Barack Obama since their days of both teaching law at the University of Chicago. In 2007, Lessig came out in favor of then Democratic primary candidate Barack Obama, citing the transformative nature of the Obama campaign as one of his chief reasons. He was subsequently mentioned as a candidate to head the Federal Communications Commission, which regulates the telecommunications industry. In computer science, "code" typically refers to the text of a computer program (the source code). In law, "code" can refer to the texts that constitute statutory law. In his 1999 book Code and Other Laws of Cyberspace, Lessig explores the ways in which code in both senses can be instruments for social control, leading to his dictum that "Code is law." Lessig later updated his work in order to keep up with the prevailing views of the time and released the book as Code: Version 2.0 in December 2006. Lessig has been a proponent of the Remix culture since the early 2000s,  in his 2008 book Remix he presents this as a desirable concept for society. On March 28, 2004 he was elected to the FSF's Board of Directors. He proposed the concept of "Free Culture". He also supports free and open source software and open spectrum. At his Free Culture keynote at the O'Reilly Open Source Convention 2002, a few minutes of his speech was about software patents, which he views as a rising threat to free software, open source software and innovation. In March 2006, Lessig joined the board of advisors of the Digital Universe project. A few months later, Lessig gave a talk on the ethics of the Free Culture Movement at the 2006 Wikimania conference. In December 2006, his lecture On Free, and the Differences between Culture and Code was one of the highlights at 23C3 Who can you trust?. Lessig claimed in 2009 that, because 70% of young people obtain digital information from illegal sources, the law should be changed. In a foreword to the Freesouls book project, Lessig makes an argument in favor of amateur artists in the world of digital technologies: "there is a different class of amateur creators that digital technologies have ... enabled, and a different kind of creativity has emerged as a consequence." Lessig is also a well-known critic of copyright term extensions. Lessig has long been known to be a supporter of net neutrality. In 2006, he testified before the US Senate that he believed Congress should ratify Michael Powell's four Internet freedoms and add a restriction to access-tiering, i.e. he does not believe content providers should be charged different amounts. The reason is that the Internet, under the neutral end-to-end design is an invaluable platform for innovation, and the economic benefit of innovation would be threatened if large corporations could purchase faster service to the detriment of newer companies with less capital. However, Lessig has supported the idea of allowing ISPs to give consumers the option of different tiers of service at different prices. He was reported on CBC News as saying that he has always been in favour of allowing internet providers to charge differently for consumer access at different speeds. He said, "Now, no doubt, my position might be wrong. Some friends in the network neutrality movement as well as some scholars believe it is wrong—that it doesn't go far enough. But the suggestion that the position is 'recent' is baseless. If I'm wrong, I've always been wrong." Despite presenting an anti-regulatory standpoint in many fora, Lessig still sees the need for legislative enforcement of copyright. He has called for limiting copyright terms for creative professionals to five years, but believes that creative professionals' work, many of them independent, would become more easily and quickly available if bureaucratic procedure were introduced to renew trademarks for up to 75 years after this five-year term. Lessig has repeatedly taken a stance that privatization through legislation like that seen in the 1980s in the UK with British Telecommunications is not the best way to help the Internet grow. He said, "When government disappears, it's not as if paradise will take its place. When governments are gone, other interests will take their place," "My claim is that we should focus on the values of liberty. If there is not government to insist on those values, then who?" "The single unifying force should be that we govern ourselves." Lessig's political opinions on copyright law have led to legal challenges where he has attempted to put them into action without legislative change. In March 2003, he acknowledged severe disappointment with his Supreme Court defeat in the Eldred copyright-extension case, where he unsuccessfully tried to convince Chief Justice William Rehnquist, who had sympathies for de-regulation, to back his "market-based" approach to intellectual property regulation. In August 2013, Lawrence Lessig brought suit against Liberation Music PTY Ltd., after Liberation issued a takedown notice of one of Lessig's lectures on YouTube which had used the song "Lisztomania" by the band Phoenix, whom Liberation Music represents. Lessig sought damages under section 512(f) of the Digital Millennium Copyright Act, which holds parties liable for misrepresentations of infringement or removal of material. Lessig was represented by the Electronic Frontier Foundation and Jones Day. In February 2014, the case ended with a settlement in which Liberation Music admitted wrongdoing in issuing the takedown notice, issued an apology, and paid a confidential sum in compensation. In October 2014, Killswitch, a film featuring Lawrence Lessig, as well as Aaron Swartz, Tim Wu, and Edward Snowden received its World Premiere at the Woodstock Film Festival, where it won the award for Best Editing. In the film, Lessig frames the story of two young hacktivists, Swartz and Snowden, who symbolize the disruptive and dynamic nature of the Internet. The film reveals the emotional bond between Lessig and Swartz, and how it was Swartz (the mentee) that challenged Lessig (the mentor) to engage in the political activism that has led to Lessig's crusade for campaign finance reform. In February 2015, Killswitch was invited to screen at the Capitol Visitor's Center in Washington DC by Congressman Alan Grayson. The event was held on the eve of the Federal Communications Commission's historic decision on Net Neutrality. Lessig, Congressman Grayson, and Free Press (organization) CEO Craig Aaron spoke about the importance of protecting net neutrality and the free and open Internet. Congressman Grayson states that Killswitch is "One of the most honest accounts of the battle to control the Internet -- and access to information itself.". Richard von Busack of the Metro Silicon Valley, writes of Killswitch, "Some of the most lapidary use of found footage this side of The Atomic Café". Fred Swegles of the Orange County Register, remarks, "Anyone who values unfettered access to online information is apt to be captivated by Killswitch, a gripping and fast-paced documentary." Kathy Gill of GeekWire asserts that "Killswitch is much more than a dry recitation of technical history. Director Ali Akbarzadeh, producer Jeff Horn, and writer Chris Dollar created a human centered story. A large part of that connection comes from Lessig and his relationship with Swartz." At the iCommons iSummit 07, Lessig announced that he would stop focusing his attention on copyright and related matters and work on political corruption instead, as the result of a transformative conversation with Aaron Swartz, a young internet prodigy whom Lessig met through his work with Creative Commons. This new work was partially facilitated through his wiki, Lessig Wiki, which he has encouraged the public to use to document cases of corruption. Lessig criticized the revolving door phenomenon in which legislators and staffers leave office to become lobbyists and have become beholden to special interests. In February 2008, a Facebook group formed by law professor John Palfrey encouraged him to run for Congress from California's 12th congressional district, the seat vacated by the death of U.S. Representative Tom Lantos. Later that month, after forming an "exploratory project", he decided not to run for the vacant seat. Despite having decided to forgo running for Congress himself, Lessig remained interested in attempting to change Congress to reduce corruption. To this end, he worked with political consultant Joe Trippi to launch a web based project called "Change Congress". 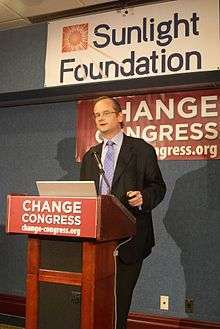 In a press conference on March 20, 2008, Lessig explained that he hoped the Change Congress website would help provide technological tools voters could use to hold their representatives accountable and reduce the influence of money on politics. He is a board member of MAPLight.org, a nonprofit research group illuminating the connection between money and politics. Change Congress later became Fix Congress First, and was finally named Rootstrikers. In November 2011, Lessig announced that Rootstrikers would join forces with Dylan Ratigan's Get Money Out campaign, under the umbrella of the United Republic organization. Rootstrikers subsequently came under the aegis of Demand Progress, an organization co-founded by Aaron Swartz. In 2010, Lessig began to organize for a national Article V convention. He co-founded Fix Congress First! with Joe Trippi. 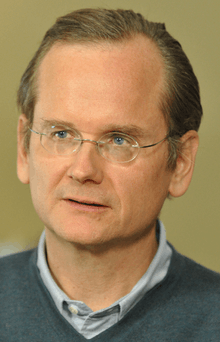 In a speech in 2011, Lessig revealed that he was disappointed with Obama's performance in office, criticizing it as a "betrayal", and he criticized the president for using "the (Hillary) Clinton playbook". Lessig has called for state governments to call for a national Article V convention, including by supporting Wolf PAC, a national organization attempting to call an Article V convention to address the problem. The convention Lessig supports would be populated by a "random proportional selection of citizens" which he suggested would work effectively. He said "politics is a rare sport where the amateur is better than the professional." He promoted this idea at a September 24–25, 2011, conference he co-chaired with the Tea Party Patriots' national coordinator, in Lessig's October 5, 2011, book, Republic, Lost: How Money Corrupts Congress—and a Plan to Stop It, and at the Occupy protest in Washington, DC. Reporter Dan Froomkin said the book offers a manifesto for the Occupy Wall Street protestors, focusing on the core problem of corruption in both political parties and their elections. An Article V convention does not dictate a solution, but Lessig would support a constitutional amendment that would allow legislatures to limit political contributions from non-citizens, including corporations, anonymous organizations, and foreign nationals, and he also supports public campaign financing and electoral college reform to establish the one person, one vote principle. The New Hampshire Rebellion is a walk to raise awareness about corruption in politics. The event began in 2014 with a 185-mile march in New Hampshire. In its second year the walk expanded to include other locations in New Hampshire. From January 11 to 24, 2014, Lessig and many others, like New York activist Jeff Kurzon, marched from Dixville Notch, New Hampshire to Nashua (a 185-mile march) to promote the idea of tackling "the systemic corruption in Washington". Lessig chose this language over the related term "campaign finance reform," commenting that "Saying we need campaign finance reform is like referring to an alcoholic as someone who has a liquid intake problem." The walk was to continue the work of NH Native Doris "Granny D" Haddock, and in honor of deceased activist Aaron Swartz. The New Hampshire Rebellion marched 16 miles from Hampton to New Castle on the New Hampshire Seacoast. The initial location was also chosen because of its important and visible role in the quadrennial "New Hampshire primaries", the traditional first primary of the presidential election. Lessig announced the launch of his presidential campaign on September 6, 2015. On August 11, 2015, Lessig announced that he had launched an exploratory campaign for the purpose of exploring his prospects of winning the Democratic Party's nomination for President of the United States in the 2016 election. Lessig pledged to seek the nomination if he raised $1 million by Labor Day 2015. The announcement was widely reported in national media outlets, and was timed to coincide with a media blitz by the Lessig 2016 Campaign. Lessig was interviewed in The New York Times and Bloomberg. Campaign messages and Lessig's electoral finance reform positions were circulated widely on social media. His campaign is focused on a single issue: The Citizen Equality Act, a proposal that couples campaign finance reform with other laws aimed at curbing gerrymandering and ensuring voting access. As an expression of his commitment to establishing citizen equality first, Lessig has said he will resign once the Citizen Equality Act becomes law and turn the presidency over to his vice president, who would then serve as a typical president pursuing legislation on a variety of issues. In October 2015, Lessig abandoned his automatic resignation plan and adopted a full policy platform for the presidency, while retaining the passage of the Citizen Equality Act as his legislative priority. He announced the end of his campaign on November 2, 2015. In 2002, Lessig received the Award for the Advancement of Free Software from the Free Software Foundation (FSF). He also received the Scientific American 50 Award for having "argued against interpretations of copyright that could stifle innovation and discourse online." Then, in 2006, Lessig was elected to the American Academy of Arts and Sciences. In 2011, Lessig was named to the Fastcase 50, "honoring the law's smartest, most courageous innovators, techies, visionaries, and leaders." Lessig was awarded honorary doctorates by the Faculty of Social Sciences at Lund University, Sweden in 2013 and by l'Université Catholique de Louvain in 2014. Lessig received the 2014 Webby Lifetime Achievement award for co-founding Creative Commons and defending Net Neutrality and the free and open software movement. Lessig was born in Rapid City, South Dakota, the son of Patricia, who sold real estate, and Lester L. "Jack" Lessig, an engineer. He grew up in Williamsport, Pennsylvania. In May 2005, it was revealed that Lessig had experienced sexual abuse by the director at the American Boychoir School, which he had attended as an adolescent. Lessig reached a settlement with the school in the past, under confidential terms. He revealed his experiences in the course of representing another student victim, John Hardwicke, in court. In August 2006, he succeeded in persuading the New Jersey Supreme Court to restrict the scope of immunity radically, which had protected nonprofits that failed to prevent sexual abuse from legal liability. Lessig is married to Bettina Neuefeind, a German-born Harvard University colleague. The two married in 1999. He and Neuefeind have three children (Willem, Teo, and Tess). Lessig said about this appointment: "Did Justice Jackson pick me to be his special master because he had determined I was the perfect mix of Holmes, and Ed Felten? No, I was picked because I was a Harvard Law Professor teaching the law of cyberspace. Remember: So is 'fame' made." ↑ "Harvard Law School Faculty Lawrence Lessig". ↑ Lessig, Lawrence. "In Defense of Piracy". The Wall Street Journal. October 11, 2008. ↑ Naureen Khan, May 2, 2014, Al Jazeera, May Day PAC wants to end all Super PACs, Accessed May 7, 2014, "kick-start May Day PAC, which, if successful, will help elect enough like-minded lawmakers to Congress in 2014 and 2016 to pass campaign finance reform ... 'Yes, we want to spend big money to end the influence of big money,' Lessig said"
↑ "Harvard professor hits $1M benchmark for White House bid". msn.com. 1 2 Foran, Clare (August 11, 2015). "Why Exactly Is Lawrence Lessig Considering Running for President?". National Journal. Retrieved August 11, 2015. ↑ Walker, Hayley (September 6, 2015). "Harvard Professor Larry Lessig Says He's Running for President". ABC News. Retrieved September 6, 2015. ↑ Marans, Daniel (October 17, 2015). "Lawrence Lessig Withdraws 'Totally Stupid' Plan To Resign Presidency". Huffington Post. Retrieved 31 October 2015. 1 2 Graham, David (2 November 2015). "The 2016 U.S. Presidential Race: A Cheat Sheet". The Atlantic. Retrieved 2 November 2015. 1 2 Lawrence, Lessig. "Curriculum Vitae". Archived from the original on July 7, 2010. Retrieved July 25, 2010. ↑ "Center helps Eastern European countries shape constitutions". Retrieved January 13, 2016. ↑ Lawrence, Lessig. "Short Biography". Archived from the original on July 22, 2010. Retrieved July 25, 2010. ↑ "Lawrence Lessig named professor of law at HLS, director of Harvard's Edmond J. Safra Center for Ethics". Harvard Law School. December 12, 2008. Archived from the original on October 10, 2009. Retrieved July 25, 2010. ↑ Lessig on "Aaron's Laws – Law and Justice in a Digital Age". YouTube (2013-02-20). Retrieved on 2013-09-19. ↑ Harvard Civil Rights-Civil Liberties Law Review – A summary of Lawrence Lessig's Chair Lecture at Harvard Law School. Harvardcrcl.org. Retrieved on 2013-09-19. Archived January 16, 2014, at the Wayback Machine. ↑ "Lessig portrayed on tonight's West Wing". Boing Boing. ↑ "Supreme Court Clerk Hiring: Is It Becoming More Political?". Above the Law. Retrieved January 13, 2016. ↑ Steven Levy (October 1, 2002). "Lawrence Lessig's Supreme Showdown". WIRED. Retrieved January 13, 2016. ↑ "YMCA Youth and Government Pennsylvania (PA State YMCA)". Ymcapa.org. Retrieved 2011-01-23. ↑ Lessig, Lawrence (2008-10-13). "McCain/Palin to YouTube: Get real (Lessig Blog)". Lessig.org. Archived from the original on May 21, 2011. Retrieved 2011-01-23. ↑ Kumar, Vishesh; Rhoads, Christopher (December 15, 2008). "Google Wants Its Own Fast Track on the Web". The Wall Street Journal. ↑ "Remix Is a Cultural Right, Lessig Says". law.virginia.edu. 2004-11-18. Retrieved 2016-02-27. 1 2 "Leadership – Free Software Foundation". Fsf.org. Retrieved 2011-01-23. ↑ "free_culture". Randomfoo.net. Retrieved 2011-01-23. ↑ "Spectrum Policy: Property or Commons?". Cyberlaw.stanford.edu. 2003-03-02. Retrieved 2011-01-23. ↑ "Digital Universe Adds Leading Internet Expert Lawrence Lessig to Board of Advisors". California: Prnewswire.com. 2006-03-13. Retrieved 2011-01-23. ↑ "commons". 2011. google video docid=7661663613180520595. Retrieved 2014-02-07. ↑ Lawrence Lessig (January 8, 2009). Colbert Nation. Comedy Central. Event occurs at 2:16. Retrieved 2009-05-19. ↑ "Freesouls - Foreword by Lawrence Lessig". freesouls.cc. ↑ Drew Clark. Software Freedom Fighters. The National Journal 33(30), July 28, 2001. ↑ Elinor Mills. Domain games: Internet leaves the U.S. nest. InfoWorld Daily News. October 13, 1998. ↑ "Q&A: Lawrence Lessig". C-SPAN. November 21, 2011. Retrieved March 26, 2013. ↑ "Larry Lessig: Laws that choke creativity". TED talks. November 15, 2007. Retrieved March 26, 2013. ↑ "TEDxNYED – Lawrence Lessig". TEDx talks. March 6, 2010. Retrieved March 26, 2013. ↑ Lessig Backs Away From Copy Fights In Courts, Congress. Washington Internet Daily 4 (42). March 4, 2003. ↑ "Lessig v. Liberatino Music – Complaint". Electronic Frontier Foundation website. United States District Court. August 22, 2013. Retrieved February 28, 2014. ↑ Laura Sydell (September 27, 2013). "Record Label Picks Copyright Fight—With The Wrong Guy". npr.org. Retrieved September 28, 2013. ↑ "17 U.S. Code § 512 – Limitations on liability relating to material online". Legal Information Institute. Cornell University Law School. Retrieved February 28, 2014. ↑ Brandle, Lars (February 28, 2014). "Liberation Resolves Copyright Issue with Lawrence Lessig, Admit 'Mistakes' Were Made". Billboardbiz. Billboard.com. Retrieved February 28, 2014. ↑ "Twórca Creative Commons wygrał sprawę o bezprawne skasowanie filmu z YouTube'a". Techlaw.pl. Retrieved February 28, 2014. ↑ Sydell, Laura (February 27, 2014). "A Win For Fair use After Record Label, Copyright Lawyer Settle". All Tech Considered. NPR. Retrieved February 28, 2014. 1 2 von Busack, Richard (February 25, 2014). "Breaking the Internet: Killswitch Screens at Cinequest". Metro Silicon Valley. Retrieved February 25, 2015. 1 2 Swegles, Fred (April 14, 2015). "Battle for Internet Control Fuels O.C. -produced Movie". Orange County Register. Retrieved April 16, 2015. 1 2 Grayson, Alan. "Grayson Screen Award Winning "Killswitch" Documentary". Congressman Grayson's House of Rep Official Web Page. Retrieved February 23, 2015. ↑ "The Price That You Pay for Rocking The Boat". Huffington Post. Retrieved March 27, 2015. 1 2 Gill, Kathy. "Lawrence Lessig at 'Killswitch' Seattle Premiere: Money, Politics, and the Battle for the Internet". GeekWire. Retrieved June 5, 2015. ↑ Lessig, Lawrence (2007-06-19). "Required Reading: the next 10 years (Lessig Blog)". Lessig.org. Archived from the original on January 16, 2011. Retrieved 2011-01-23. ↑ "Lessig's blog July 29, 2007 11:55pm". Archived from the original on October 15, 2012. ↑ Lawrence Lessig (February 8, 2010). "How to Get Our Democracy Back". CBS News, The Nation. Retrieved 2011-12-14. ↑ "Draft Lessig – Change Congress". Draftlessig.org. Retrieved 2011-01-23. 1 2 Lessig, Lawrence (2008-02-25). "On why I am not running (Lessig Blog)". Lessig.org. Archived from the original on January 16, 2011. Retrieved 2011-01-23. ↑ Previous post Next post (2008-03-20). "Stanford Law Professor Larry Lessig Bets 'Wikipedia' Approach Will Transform Congress | Threat Level from Wired.com". Blog.wired.com. Retrieved 2011-01-23. ↑ "Sunlight Foundation Webcast". Visualwebcaster.com. Retrieved 2011-01-23. ↑ Rootstrikers and United Republic, Lawrence Lessig, United Republic, November 16, 2011 Archived December 19, 2011, at the Wayback Machine. ↑ About Us, United Republic Archived February 7, 2012, at the Wayback Machine. ↑ "Call a Convention". Call a Convention. Retrieved 2011-01-23. ↑ About, Fix Congress First! ↑ "Democracy in small states". LESSIG Blog, v2. Retrieved January 13, 2016. 1 2 Lawrence Lessig, "Why We're Marching Across New Hampshire to Honor Aaron Swartz", The Atlantic, January 10, 2014. ↑ Jennifer Harper, "Restless grassroots: New Hampshire 'Rebellion' declares their state is not for sale" (Inside the Beltway column), Washington Times, December 25, 2014. ↑ John Koziol, "NH Rebellion Marching Its Way to Concord for Reform", New Hampshire Union Leader, January 17, 2015. 1 2 Flore Vasseur, "The New Hampshire Rebellion: Larry Lessig's Long Walk", The Medium, December 15, 2014. 1 2 3 4 5 Merica, Dan (August 11, 2015). "Harvard professor Lawrence Lessig is exploring a long shot presidential bid". CNN.com. Retrieved August 11, 2015. ↑ "The Scientific American 50 Award". Scientific American. Retrieved January 13, 2016. ↑ "Eight scholars elected to academy of arts and sciences". News-service.stanford.edu. 2006-04-24. Retrieved 2011-01-23. ↑ "Fastcase 50". Retrieved January 13, 2016. ↑ "Honorary Doctor at the Faculty of Social Sciences 2013". Archived from the original on December 19, 2013. Retrieved December 19, 2013. ↑ "Fête de l'université 2014 - Doctorats honoris causa". ↑ "The Webby Awards Gallery". 2014. Retrieved 2014-04-30. ↑ "Wired 10.10: Lawrence Lessig's Supreme Showdown". wired.com. ↑ Heilemann, John (2005-05-21). "Lawrence Lessig and John Hardwicke Fight Sexual Abuse and the American Boychoir School". Newyorkmetro.com. Retrieved 2011-01-23. ↑ Lessig, Lawrence (2005-05-25). "living with ghosts (Lessig Blog)". Lessig.org. Archived from the original on January 16, 2011. Retrieved 2011-01-23. ↑ "Hardwicke v. American Boychoir". ↑ "Personal Life - Lawrence Lessig: A Biography". Hyperink.com. Retrieved 2015-08-12. ↑ Archived July 16, 2012, at the Wayback Machine. ↑ "USCA-DC Opinions – Released On 1/21/2011". Pacer.cadc.uscourts.gov. Retrieved 2011-01-23. ↑ Lessig blog Archived October 15, 2012, at the Wayback Machine. ↑ Grayson, Alan. "Grayson Screens Award-Winning "KILLSWITCH" Documentary". US House of Representatives. Retrieved February 25, 2015. "Lawrence Lessig". Harvard Law School Faculty Directory. "Lawrence Lessig: Big Brother's Prying Eyes". Bill Moyers. Lawrence Lessig. "Republic, Lost: How Money Corrupts Congress—and a Plan to Stop It". Youtube. Lawrence Lessig. "We the People and The Republic We Must Reclaim". TED Talks.